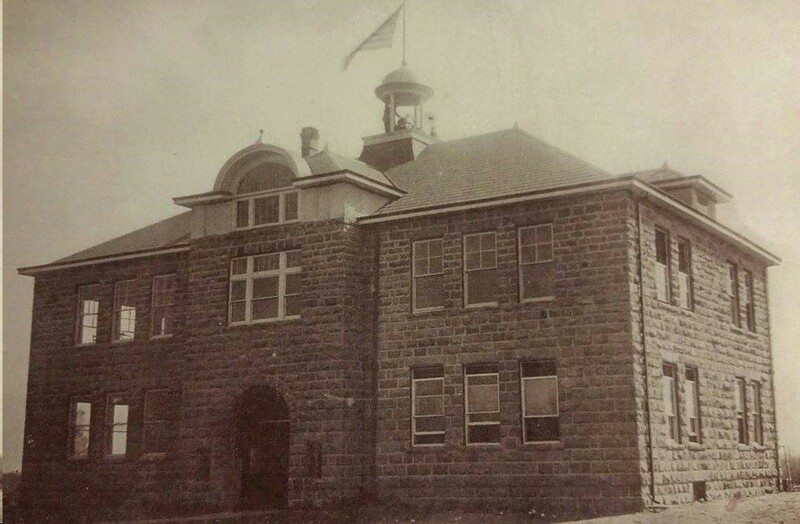 ‍The first recorded Indianola School was established in February 1895. On October 18, 1898 Lyman H.Perkins, a Choctaw farmer and later a Choctaw Councilman and Statesman, who had originally owned all the land on which the Town of Indianola was built, donated1 acre for construction of a Methodist Episcopal Church. After the congregations erected a church building, school was also held there. In 1902 the Fort Smith and Western Railway built a line one mile to the north of the community along the south bank of the South CanadianRiver, and Indianola relocated to be adjacent to the tracks. The original site was thereafter called "Old Town." After the town moved, various churches housed the school. Around 1903 or 1904 residents built a little red school building. On June 5, 1909, Perkins and his wife, Hattie Steward Perkins, donated four acres to the town. Soon a new, two-story, sandstone school stood on this location. At the turn of the 20th Century, to accommodate primarily rural farming families without modern transportation, there were schools districts every few sections of land throughout all of northernPittsburg County. As our society became mobile and the years progressed many of these school districts consolidated with other districts. School districts that all or some students merged with Indianola Schools in its history have included:Bald Mountain, Byington, Choate Prairie, Fairview, Huelow, Nale, North Mt Homa, Oak Hill, Rock Creek, Rocky Point, Scipio, Shady Grove, South Mt. Homa, SpringHill, Tannehill, Thurman, and possibly others. Since its establishment in 1895 and its first graduating Senior Class of 1928 Indianola Public Schools has been providing quality primary and secondary education to the children and youth of the area for over a century. Students have taken the foundational learning provided and have successfully pursued many life paths that can be attributed to a successful beginning at Indianola Schools. For up to date information about events, inclement weather, or emergencies happening at the school download the SchoolWay app.